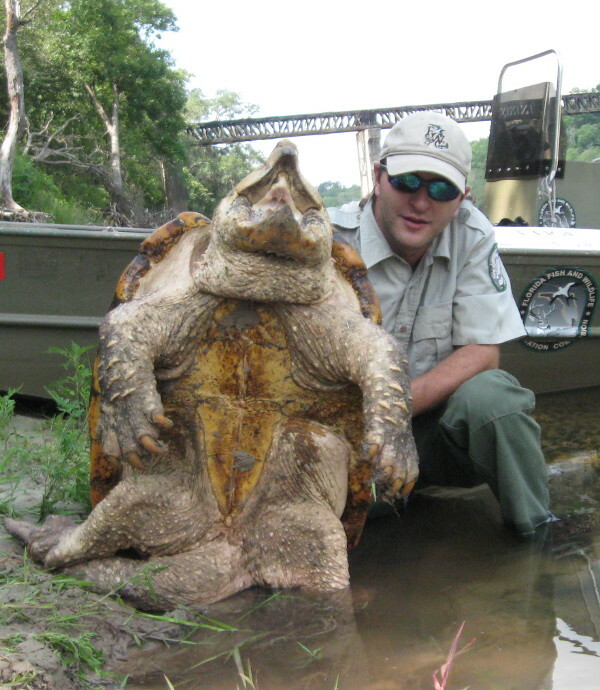 The largest freshwater turtle in North America, the Alligator Snapping Turtle is among the largest turtles on the planet. Prehistoric in appearance, the turtle features a spiked beak, hooked jaw and a tail thick with scales, as well as eyes on the sides of its head. It is more commonly referred to as the “dinosaur turtle of the world” and is capable of snapping off a finger with just one bite. The turtles can weigh around 50 pounds for the female and between 175 to 220 pounds for males, reaching shell lengths of around 26 inches on average. Their enormous heads are so large they are unable to retreat into their shells. 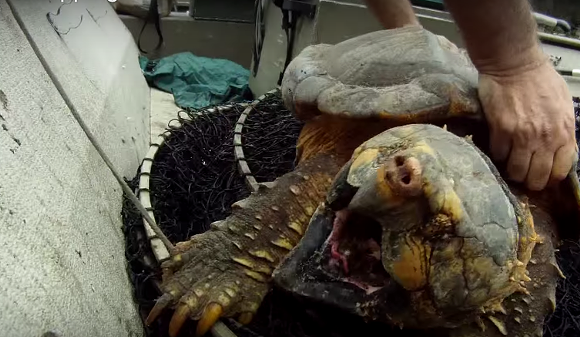 Florida Fish and Wildlife scientist Travis Thomas with a Florida Alligator Snapping Turtle. Photo credit scientificamerican.com. Typically, these snapping turtles spend the majority of their lives under water, with the one exception being when the females come on land to lay their eggs, which typically happens between February and April. Females will begin to make nests in sandy spots by the water in later April, laying between 17 and 52 eggs. After a period of around 100 days, the eggs will hatch, typically in the middle of August, with the young hatchlings heading straight for the water to begin their lives. The animals are bottom walkers, rarely swimming through the water, making them hard to spot in the wild. However, they do enjoy sunning themselves in shallow waters, making it a common occurrence to see just their eyes and nostrils as they wade in the mud. The animal is able to stay submerged for almost a full hour before it needs to come up for air, and features a bright red worm-shaped tongue that acts as a natural fishing lure while underwater. The animals typically hunt at night. They are capable of keeping their mouths open and can move their tongues with purpose, wiggling it to better attract fish. While it will bite anything, the animals prefer to eat fish, snails, mussels, frogs and crayfish, as well as other turtles. Living between 50 and 100 years, the snapping turtle is more commonly seen in rivers, canals, and lakes within the southeastern states, giving those with plans for Florida travel a good chance at seeing one in the wild. Most commonly, these animals can be found in the Suwannee River drainage area through the Panhandle of Florida. Those planning a trip hoping to see one of these animals should consider sticking close to one of the rivers that drain into the Gulf of Mexico, as the animals seem to prefer to be in water with a deep running current. However, they have also been spotted in brackish water. Those considering RV camping with the hopes of seeing these animals may want to consider state parks in Pensacola or Santa Rosa. If you are thinking about a trip in April or August and are hoping to see the females laying on the beach or even the newly hatched turtles making their way to the water, Florida has some wonderful beach camping sites. Set up a tent right on the sand and breathe in the fresh air as you enjoy the sunset. Just make sure to bring your own firewood. While beach camping is typically free of charge, there may be an entrance fee. Be sure to conduct research before you arrive and ask the rangers there where the best chance is that you will have to see an alligator snapping turtle. Remember to use caution with these majestic animals though and do not touch!